Croan Cottages are Four Star, traditional Irish self catering cottages in Kilkenny. 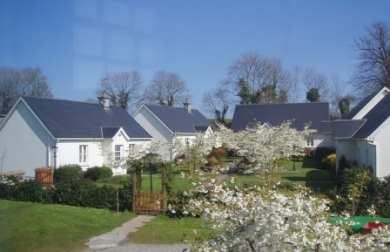 The cottages are set around a central courtyard on the grounds of historic Croan House. Croan Cottages offer outstanding accommodation for self catering holidays in Ireland. Each 2 bedroom cottage has one double bedroom and one twin bedroom as well as a bathroom (with bath and power shower), a living room (with open fire) and a kitchen and dining area. Although the cottages have a traditional style and are on an old estate, they were built recently and have been furnished to an exceptionally high standard. The cottages boast all the mod cons one could expect from four star self catering accommodation, including fully fitted kitchen with dishwasher, washer/dryer, fridge/freezer, cooker, microwave, TV and central heating. Each cottage has an open fire in the lounge for Autumn or Winter evenings and direct access to private patio and barbeque area for al fresco dining and lazy summer evenings. All of the cottages are designated as ‘No Smoking’. Smoking is permittted outside. Pets are permitted to stay with their owners in some of the cottages by prior arrangment. There is also a selection of board games and video games that guests can borrow.